It doesn’t matter your mail volume! Every business needs, at minimum, a digital scale to be effective and efficient in handling daily mailing needs. This article dives into the 4 most prominent reasons. We’ll cover one really striking situation where you could be paying double for postage if you don’t invest in a digital scale. That hurts. 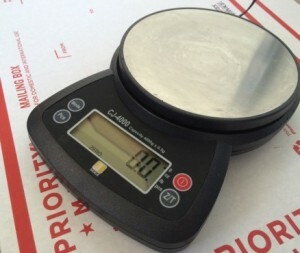 Digital scales can be purchased for as little as $10 to $20 (here’s the one I use because it doubles well as a kitchen/coffee scale ), and can offer savings in many magnitudes — usually around $1 per package. It’s easy to see the ROI on that solution. If you use a service like Stamps.com, you can easily opt in to add a scale that syncs with their online mail portal. The most important reason to own a digital scale is to save time and money by avoiding the post office. While it’s great to work with a USPS postage pro who can answer questions and help you decide on the right mailing services for you… you’ve heard the truth a hundred times here on Price of a Stamp: going to the post office is unfortunately a waste of time and money. The digital scale I use every day in my business. And the reason you’re wasting time is by travelling to the post office and waiting in line. The USPS offers pick-up options for nearly any situation. Small items can be left in your mailbox for the postal worker to collect during his or her regular drop-offs. Many small businesses only carry a few items — maybe even just one item. So they spec out approximately how much these items will weigh based on historical postage prices at the Post Office or product specifications and then use these numbers on a daily basis. Or, they use a bathroom scale (since they’re easy to obtain) and use that to weigh a few items, then round up to account for a bathroom scale’s margin of error (which could be as bad as +/- 10%). Some businesses print out the same weight’s worth of postage for every shipment or load on postage stamps until the price of the stamps exceeds the required postage. If you weigh your packaging and products this way or pay for postage like this, you could be vastly overpaying for postage. Generally, the reason is obvious: by rounding up, you’re naturally adding weight to your shipments and then buying extra postage or stamps to compensate for it. Another factor that contributes to your rounding error is packaging. Day-to-day, the amount and type of packaging you and your employees use will fluctuate. 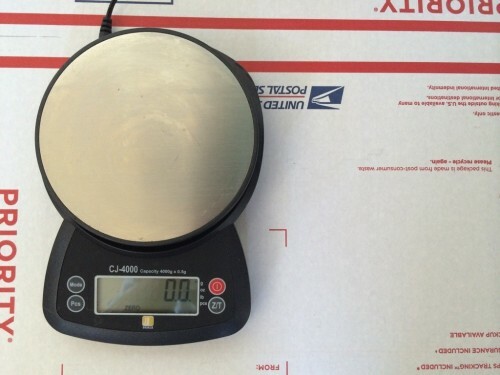 Using a scale will give you exact weight measurement for each shipment and avoid rounding up and over-paying. If you use a digital scale on a daily basis in your business, over time, you and your employees will discover cheaper, lighter packaging solutions. By simple virtue of the fact that you and your team will be measuring your postage pricing and weights every day, attention will be brought to how much money is wasted and where. Given this advantage, push it to its limit by experimenting with different packaging (paper, bubble wrap, peanuts) and different containers (envelopes, cardboard, paper stocks). Over time, you’ll learn how these things impact the cost of mailing. Under-paying for postage can wreak havoc on your business in many ways. It’s one way you can guarantee to pay more than 200% the regular postage rate. Here’s why: sometimes, if you put too few stamps on a package or pay for less postage than a package needs, the item will be returned to your doorstep. You aren’t reimbursed for the first round of postage and its value will be “cancelled” (stamped with a logo, rendering it useless). When you mail the package to the customer again, you’ll have to pay for more postage — effectively doubling the cost of mailing that item. Another way that underpaying for mail can impact your business is when the package actually arrives at your customer’s door… because sometimes, the USPS will deliver the item with “postage due.” This means the postman will ask your customer to pay for the additional missing postage. This involves a somewhat convoluted process that could cause your customer some trouble. It’s bad customer service and it’s generally very unprofessional to leave your fans and prospects with such a headache. Don’t wait another minute — invest in a digital scale so you can start saving your business’s valuable resources. You’ll avoid over and underpaying for postage, empower your biz to test packaging solutions and get discounted rates from the USPS. You can get one for about $20 on Amazon , and like I said, I use this beautiful machine for my own business. You can also bundle in a digital scale when you sign up for a mailing service like Stamps.com — these have the added fancy feature of integrating with the software, pulling in the weight information automatically.